The Denver Art Museum is today’s “Museum of the Day”. Yet another art museum with an outstanding track record of prioritizing design and stunning architecture, the museum stands out as one of the state’s most emblematic institutions. The Denver Art Museum is one of the largest art museums between Chicago and the West Coast, with a collection of more than 70,000 works of art divided between 10 permanent collections including African, American Indian, Asian, European and American, modern and contemporary, pre-Columbian, photography, Spanish Colonial, textile, and western American art. Founded in 1893 as the Denver Artists’ Club, the Denver Art Museum has had a number of temporary homes, from the public library and a downtown mansion to a portion of the Denver City and County Building. 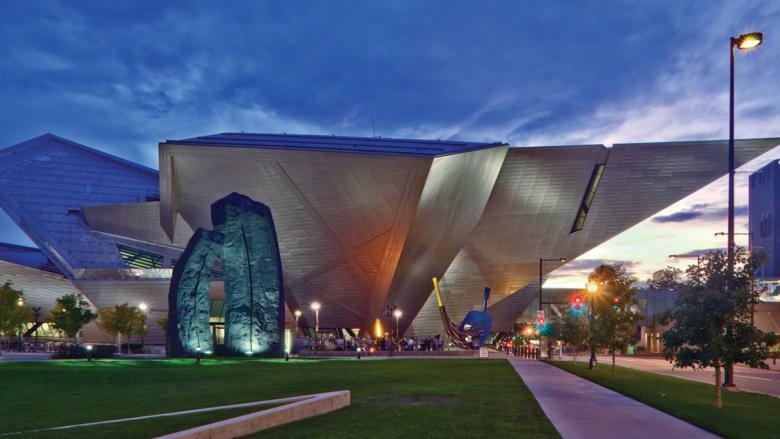 In 2000, the architect Daniel Libeskind designed the 146,000-square-foot Frederic C. Hamilton Building, a joint venture of Daniel Libeskind and Denver-based Davis Partnership Architects. On October 7, 2006, the Denver Art Museum nearly doubled in size when it opened one of the country’s most unique structures. The Frederic C. Hamilton Building includes new galleries for its permanent collection, three temporary exhibition spaces, art storage, and public amenities. The entire museum complex totals more than 350,000 square feet and serves as an architectural landmark for the city of Denver and the surrounding region. The Denver Art Museum has been a leader in educational programming for more than two decades. The family-friendly approach is fully integrated into the galleries through a unique partnership between curators, designers, and educators for each discipline. A trailblazer in creating innovative opportunities that encourage visitors to interact with the collection, the museum is also known internationally for the way we help our visitors explore art and their own creativity.